With Spring coming in with a roar, the kids are wondering what the Easter Bunny might put in their baskets. Of course, he might bring the usual helping of jelly beans, marshmallow treats and a variety of eggs. This year why not give a treat that is a little different. This year the bunny is bringing my family a BROOKIE COOKIE sampler. Now in its third year of business, the BROOKIE COOKIE has a fun sampler pack. In this sampler pack, everyone has a flavor that makes them smile. For those of you not familiar with a BROOKIE, it is a cookie that tastes just like a brownie. 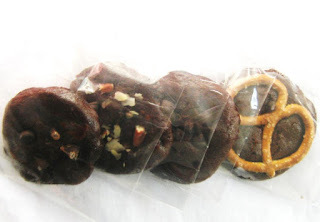 Made in Brooklyn, New York, these tasty treats are the exact chocolatey goodness to end any meal or a special treat. BROOKIE COOKIE offers a variety of treats that can be shipped throughout the US. From the original BROOKIE COOKIE to Creampies and Biscotti and Pretzel Pops, you can find a treat that is perfect for your family. What's in this sampler pack? The four flavors are cremepie, almond pecan, original, and pretzel crunch. Personally, I am a huge fan of the pretzel crunch. The salty and sweet combination is the perfect end to any meal. For my kids, they love the almond pecan options because they will eat anything with nuts. Basically, this sampler pack is perfect for our family because everyone has a favorite and there is no complaining. Would you like to try the BROOKIE COOKIE sampler for yourself? I have mini samplers to give to a reader. Please use the Rafflecopter to enter. Disclosure: I may be compensated for my time by receiving this product and by giving it away. All opinions are my own. Cremepie is the flavor I'd like to try...thanks! Pretzel Crunch is my choice! Let's start with pretzel crunch. Almond pecan sounds great ! I am excited to try the creme pie. I am most excited by the Creme Pie variety. I would love to try almond pecan! Creme Pie would be my Brookie Cookie of choice! Which BROOKIE COOKIE flavor are you excited to try? I can't wait to try the Creme Pie. I am excited to try the Almond Pecan. I would LOVE to try the almond pecan! I think they all sound great! The creme pie would be my first choice. I want to try the Pretzel Crunch. Definitely the Pretzel Crunch! I am a big ole fan of the sweet and salty combo! They all look amazing but I want to try Pretzel Crunch! I am most excited about trying the Cremepie. I would like the creme pie! Pretzel Crunch. Omg, that looks so good! That pretzel topped one looks good! I had a cream pie, mmmmm. I want to try the creme pie! in their profile pic!